or a picturesque country village! Now imagine being able to buy whatever you find. and that you will have no problem getting it home. 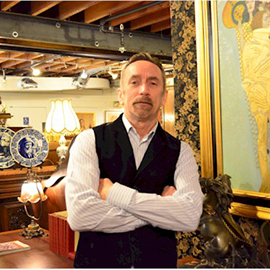 My name is Robert McCartney and I have been buying and selling European Antiques in San Francisco for over 35 years. I bring in 5-6 containers of beautiful furniture and accessories every year to our store in San Francisco. Our website, GCSAntiques.com is an easy introduction to what you can expect to find, plus much more, on our user friendly antiques tour. As one would imagine one of the best parts of this business for me has been the opportunity to travel the world looking for things that I love to buy and sell. In the past 35 years I have met and developed strong relationships with many dealers in Europe. Honest, reliable, people who have been in the Antiques business for most of their lives and have children ready to take over when the time comes. Individuals with established businesses that have proven to be good people to do business with, are what make up our tours. On our tours you will find an excellent selection of 18th and 19th Century to Vintage Modern French, German, Dutch and Flemish furniture. We are very familiar with the nuts and bolts of how to arrange for the gathering, wrapping, packing, loading, and shipping of container goods from several ports in Europe. We know how to have it all delivered promptly and safely to our store in San Francisco for pick up or delivery anywhere in the world. We can arrange for lodging and transportation as well as interpreters to fit almost any budget and schedule. Check out the Buying Tour Agreement that we sign with all of our touring clients. This agreement details the logistics including costs and liabilities associated with our tour. We have tried to make it as simple and straight forward as possible. Feel free to ask questions by contacting us face to face in our store, by email or just give us a call. We want your trip to be as hassle free and fun as possible while offering you the opportunity to see and buy from a selection of goods few people will ever have access to.